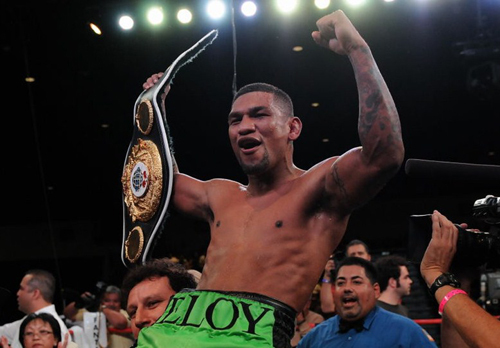 Eloy Perez Looking To Solve "The Problem"
"It's not about the fame or the money, it's about winning that world title." That's what undefeated Super Featherweight Eloy "The Prince" Perez (23-0-2,7 KO's) says when asked about his upcoming title fight with WBO Super featherweight Champion Adrien "The Problem" Broner who also sports an unblemished record of 22-0 with 18 KO's. On February 25th in St. Louis, Missouri HBO will broadcast a double header that features Devon Alexander vs. Marcos Maidana in the main event. The show will open with Perez taking on Broner in a bout that is a dream come true for Perez who said, "Fighting on HBO will be great, I mean this is where every fighter wants to be and now I have the chance, I am not going to waste this opportunity!" The fighter who now lives in Salinas, California has spent the early part of his career there and in Rochester, Washington will now be stepping into the bright lights of St. Louis but he seems very at ease with the step into a big city fight. Says Eloy, "I love to travel and I have been to St. Louis before. It is a great city, the people were wonderful and I can't wait to go back to show them what I can do." While Eloy is a pretty quiet and humble kid, the same can't be said for his foe. Anyone who has caught Broner's act knows he is the polar opposite. Broner has already started the personal digs at Perez but Eloy will not be returning the verbal barbs, "He can talk all the trash he want," proclaims Perez, "I hear he is making fun of me eating burritos...'whatever'...I don't like burrito's, I don't even like tortillas. But if talking like that makes him comfortable that's fine. It all comes down to what happens in the ring that night. That's where I will let my talking happen...in the ring!" When asked if he saw the Broner fight with Daniel Ponce De Leon, who many thought beat Broner that night, and if he can use some of that De Leon fight footage to learn from, Perez answered, "I don't watch tape, I let my managers and trainers break that down and they set up my gameplan for me and we go from there, then we execute the plan and solve "The Problem". But yes, I have heard that Broner got beat that night. But regardless, he is the Champion right now and I give him props for that and I thank him for giving me this shot at his title." With undefeated records in both corners that night Perez knows someone will walk out of the ring with a blemish but he also understands that's the nature of the beast and he is quick to acknowledge the managers and promoters for helping get them to this position. Says Perez, "I know someones 0 has got to go, I hope it won't be mine. He's got a great manager in Al Haymon and he has got him where he wants to be. On the other hand I have a great promoter in Golden Boy and they have got me this shot, I could not ask for anything more than that and I am going to do everything I can to remain undefeated and win that title. Like I said, it's not about the money and it has nothing to do with the fame. I am a fighter and I have worked hard to get to this point, to me it's all about winning that belt." In closing Eloy reached out with a word of thanks to his manager Kathy Garcia and his Publicity agent Rachel Charles, "I thank you both for everything...we're gonna do it!"